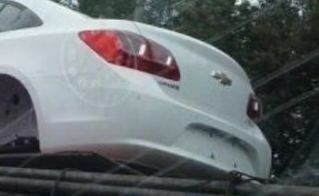 What we speculate is the shell of a facelifted Chevrolet Cruze has been spotted riding on the back of a flatbed in China. The car was seen in the Chinese city of Wenzhou being carried on the back of the truck, rather carelessly we might add, on top of some logs. Because China. The facelift appears to include a revised grille, new bumpers, and new lights. The biggest changes are out back, with different taillights, a larger Chevrolet bowtie, and the relocation of the license plate from the trunk lid to the rear bumper cover. We have to say that the changes are rather handsome, though there’s no indication if the North American model will receive these enhancements. According to Car News China, the refreshed Chevrolet Cruze is anticipated to bow at the Guangzhou Auto Show in late November and is expected to hit the Chinese market around the same time. Update: the model seen here is the Chevrolet Cruze Classic, which will continue being available alongside the all-new D2XX-based model. Looks a bit inspired from the 1995 Cavalier…. A bit Chevy Prizm, if you ask me. Click on the link to the new Cruze at the nurburgring story, this is not the new Cruze shown in that video testing. This car is a lightly altered current gen. Cruze by the looks of it. You are correct. Whereas this is a refreshed, restyled Cruze for 2014, the car caught testing on the Nurburgring will be an all new model for 2016. I agree with all of the above comments above about the Prizm & Cavalier, but also that it looks good. I see a Cavalier and Malibu. I hope they will forgo a refresh with the new car so close here. The present one here looks better. I do not expect this one to come here in 2015. The rear looks a little bit like the Chrysler Sebring. How can that be a 2014 model? I am currently driving a 2014 and it in no way shape or form looks like that. If anything it is a facelifted 2015 model arriving before the fully refreshed 2016 models. We have no way to confirm or deny that this facelift will reach the U.S. market. With a new car not that far out I would expect they would not go for change just for the 2015 models. That is unless they send this one to fleet use in 2016. This would make a great fleet car as it would keep the present owner in a better looking car with better resale. One has to think big picture here as the W body Impala will go away around the same time as the fleet baby. Am I the only one who sees the rear end of the 2014 Malibu here? Why are all cars looking like each other nowadays? What a terrible idea.